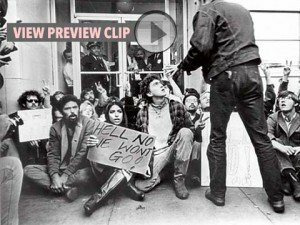 An estimated 500,000 young men evaded or refused to cooperate with the draft, and 3,250 went to prison for their beliefs, the largest mass incarceration of war resisters in U.S. history. The film tackles this broad narrative mostly through the story of David Harris (who spent three years in Federal prison for refusing to be drafted, and for encouraging others to do the same) and his wife, folksinger Joan Baez. Interviews with many other draft resisters round out the narrative. As part of understanding the Vietnam era, the film also reviews the history of the draft, and opposition to previous drafts, and the Vietnam war. Resistance to the war is tied into the larger civil rights movement, two sides of the same coin in opposing unjust actions by the government, with the inclusion of the Reverend Martin Luther King, Jr. visiting Joan Baez and those jailed for blocking the Oakland Draft Board in 1967. To a younger audience, the film is perhaps a bit funny, guys with weird hair and unhip clothing burning whatever draft cards were. For a cynical generation, it is as easy to dismiss the value of individual action as it is wrong to do so. Indeed, the actions of one person alone can amount to little. But as an interviewee says, you never know who’s watching. The Boys Who Said No! illustrates how one can become two, two can become ten, and over time they together remind you all that sand on the beach was once a rock. The Boys Who Said No! thus resonates strongly today. It offers an answer to the question of what courage is in a modern world: not only choosing the harder right over the easier wrong, but being willing to pay the price for acting on conscience, for a good bigger than oneself. And in that definition, the actions of men like David Harris and the thousands who joined him in refusing the draft, become clearer. The path they put themselves on leads in a straight line through whistleblowers Ellsberg (Pentagon Papers), Drake and Binney (NSA), Manning and Assange (Iraq War), Kiriakou and Sterling (CIA) and Snowden. Acts of conscience never go out of fashion, and a country never has enough examples. That’s what makes a film like The Boys Who Said No! more than historical document. To many today the war in Vietnam seems as old as the battles at Gettysburg and Antietam. But think about this: Vietnam was a war started on false pretenses (U.S. ships attacked in Gulf of Tonkin, Weapons of Mass Destruction in Iraq), built on deeply flawed fear (Communism will overtake Southeast Asia, a caliphate will engulf the Middle East), a faux-threat to the United States/Homeland (Communists on the beaches of California, Islamic terrorists in your town) and the strategy of extraordinary means spent for limited ends. Very, very similar comparisons apply to America’s war in Central America during the 1980s. And before you dismiss that by saying the struggle against Islamic terror is “different,” remember this: history shows those who resisted the war in Vietnam, and that in Central America, turned out to be right. The Boys Who Said No! is currently in production, but in need of additional funding for completion. Take a look at a 17 minute excerpt, and visit the project’s website, Facebook, or Indiegogo page if you wish to contribute. The Boys Who Said No! was directed is Judith Ehrlich, who won an Academy Award nomination for The Most Dangerous Man in America: Daniel Ellsberg and the Pentagon Papers. The producer is Christopher C. Jones, who at age 17 refused to register for the draft, was arrested and served nine months in federal prison. As the documentary is not complete, my comments above are based on previews and clips I have seen. Versus the Boys who just wanted the Dough. Back to the Pentagon we go. Maybe the Panama Papers will do what the Pentagon Papers didn’t -start the dominoes falling for the guys who were making a killing. I understand the context of the “Girls say yes to boys who say no”. But, wow, does it seem antiquated today. Are ‘girls’ some sort of prize, even if self-awarded, for actions that guys take? This treats women as trophies; their actions are determined by male decisions. Luckily things have changed, but as a documentary their job is to show what things were like then. In fact, it was Joan Baez herself who came up with the slogan. Sorry, point omitted in previous comment: the ‘girls’ value is their sexual availability. Yuck. I was one of them. Three years in the federal joint (max security).